The Best Sailing blogs from thousands of top Sailing blogs in our index using search and social metrics. Data will be refreshed once a week. Also check out Sailing Podcasts and Sailing Videos from Best 10 Sailing Youtube Channels. 2.40 Where is Brick House? 2.50 Sailing To Win Blog! Sailing newsletter is a comprehensive summary of the day's most important blog posts and news articles from the best Sailing websites on the web, and delivered to your email inbox each morning. To subscribe, simply provide us with your email address. Rhode Island About Blog Sailing World is your go-to site and magazine for the best sailboat reviews, sail racing news, regatta schedules, sailing gear reviews and more. Facebook fans 203,308. Twitter followers 36,237. Carlsbad, CA About Blog Sailing Anarchy has become the largest sailing site on the net. Sailing Anarchy will present topics, ideas and, critiques that have never been written about before. But perhaps most importantly, they have a Message Board where robust discussions will be encouraged. Facebook fans 144,679. Twitter followers 37,613. San Francisco, CA About Blog Sailing is a place to ask about, share, show, and enjoy all about sailing, sail boat racing, and technical discussions from Reddit. Facebook fans 1,073,934. Twitter followers 461,886. Mountain View, CA About Blog Comprehensive up-to-date news coverage on Sailing, aggregated from sources all over the world by Google News. Facebook fans 21,770,045. Twitter followers 212,780. San Diego, CA About Blog Scuttlebutt Sailing News provides major sailing news, commentary, opinions, features and dock talk with a North American focus. Facebook fans 53,125. Twitter followers 20,209. Facebook fans 3,779. Twitter followers 20,153. Boston, MA About Blog SAIL reflects the way active, committed sailors spend their time on the water with stories on coastal cruising, the technical aspects of sailing, new boat coverage, chartering, boat upgrades, gear and more. Facebook fans 54,439. Twitter followers 34,551. London About Blog Sailing news, blogs, boat and gear reviews from Yachting Monthly. Facebook fans 19,748. Twitter followers 26,182. Austin, TX About Blog This Sailing Blog is packed with hundreds of sailing tips, tricks and suggestions. NauticEd is an International Sailing School using advanced interactive eLearning sailing courses. Facebook fans 5,651. Twitter followers 257. Republic of Croatia About Blog Sailingeurope provides best bareboat or skippered yacht charter deals! Large offer of sailing yachts, catamarans, motor and luxury yachts. Follow this blog to find yacht charter tips & tricks; discover best marinas, sights and restaurants in popular sailing destinations; read our reviews of yachts, gear and sailing apps. Facebook fans 95,148. Twitter followers 8,168. About Blog Catamaran Racing news and design. Facebook fans 9,932. Twitter followers 1,704. About Blog We have decided to sail the world. Yep, like many others. We sold up, rehoused the cats ( that was such a wrench, we loved those cats) and moved onto a boat. We left London , sailed the West coast of Europe and all the way to the Canaries. Facebook fans 1,900. Twitter followers 3,887. USA About Blog XS Sailing is about high-performance sailing. The daily one stop site for sailing news and more. XSracing was formed to promote, expand and unify the racing of multihulls and sportboats. Facebook fans 376. Twitter followers 170. UK About Blog Sailing Today is the magazine for hands-on cruising sailors whose love of sailing takes them around the British Isles, across the Channel and beyond. Offering a wealth of practical advice and a dynamic mix of in-depth boat, gear and equipment news, Sailing Today is written cover to cover by sailors, for sailors. Facebook fans 3,822. Twitter followers 3,956. About Blog Sail Universe is created by a group of professionals, photographers and technicians brought together by their passion for sailing. It is a web galaxy dedicated to sea and sailors, cruising and adventures, gears and videos. Facebook fans 50,373. Twitter followers 543. About Blog Sailing Totem authored by Behan is all about her travel stories around the world through sailing totem, her sailing life, adventures and shares acquired her knowledge about sailing. Facebook fans 10,687. Twitter followers 2,868. London, UK About Blog Sailing top stories, Sailing galleries, latest news from around the world from The Telegraph. Facebook fans 3,951,474. Twitter followers 1,988,031. Crete, Greece About Blog We are liveaboards on our boat Cygnus III sailing around the world. I don’t know where we go from here but I promise you it won’t be boring. Facebook fans 952. Twitter followers 1,295. Australia About Blog Seabreeze has grown to become one of the most popular & respected Weather/Watersports sites in Australia. Facebook fans 25,350. Twitter followers 867. Rhode Island About Blog Cruising World is your go-to site and magazine for the best sailboat reviews, liveaboard sailing tips, chartering tips, sailing gear reviews and more. Facebook fans 120,186. Twitter followers 6,742. Hampshire, United Kingdom About Blog News and Features from the Official Website of World Sailing, the world governing body for the sport of sailing. Facebook fans 241,214. Twitter followers 27,552. UK About Blog Rooster Sailing blog all about tips, tecniques, hints, boat work, safety, sailng apparels, essentials and more. Facebook fans 15,334. Twitter followers 1,046. London and Southampton About Blog First Class Sailing is an RYA recognised sailing school, with sailing courses and sailing lessons that cover both the theory and practical side of sailing. Follow this blog for All the latest news from the world of sailing and stories from experienced sailors. Facebook fans 3,066. Twitter followers 784. Stockholm, Sweden About Blog Andy Schell's evolving thoughts on the technical and philosophical aspects of offshore adventure sailing, including yacht design and outfitting, weather forecasting, sail selection, watch rotations and leadership, emergencies at sea and more. Facebook fans 3,607. Twitter followers 860. Facebook fans 1,666. Twitter followers 1,982. CT USA About Blog WindCheck is a monthly magazine devoted to sailors and powerboaters in the Northeast. Every issue features those who race, cruise and learn to boat in the region. Facebook fans 1,499. Twitter followers 109. About Blog An online maritime publication and the worlds largest independent alliance of Vintage, Classic and Spirit of Tradition yacht owners, sailors, merchants, scientists, environmentalist, and preservationist committed to keeping the spirit of the legends of sailing alive. Croatia About Blog Danielis Yachting was founded by people with many years of experience in nautical tourism in Croatia with the real in-depth knowledge in the field, familiarity with the problems that may occur, and understanding of the service that will completely satisfy our clients. Our main activity is to act as an agent in offering yachts for charter in Croatia, bareboat, skippered or fully crewed yachts. Facebook fans 5,391. Twitter followers 573. About Blog 48° North is a magazine written for sailors by sailors. A place where sailors can be comfortable sharing ideas and experiences. Facebook fans 2,809. Twitter followers 96. Hamilton, ON About Blog Ontario Sailing is a not-for-profit, volunteer organization committed to the promotion & development of all aspects of boating and sailing in Ontario. Facebook fans 1,810. Twitter followers 926. About Blog Offshore sailing adventures on the S&S Swan 48 Isbjorn. Sailing passages on the world's oceans with Andy Schell & Mia Karlsson. Experience hands-on expedition-style ocean sailing in the Atlantic, Caribbean, Baltic, Pacific, Arctic & beyond on a classic, fast & safe ocean sailing machine! Facebook fans 1,426. Twitter followers 683. South East, England About Blog The most advanced sailing simulator for yacht handling, navigation skills, mooring and anchoring. With eSail you learn how to sail a 36' sailing yacht then explore the sea around a collection of islands and take part in challenges and races. Facebook fans 69. Twitter followers 1. London, England About Blog Sailing around the world very slowly, enjoying the planet, blogging and vlogging. About Blog Yacht Narwhal undertakes sailing expeditions in the wildest places on earth, predominantly in the arctic high latitudes. Our adventures include sea kayak expeditions as well as marine mammal surveying, plastic pollution research and beach clean ups. Get on board and follow us on our adventures. Facebook fans 733. Twitter followers 36. Hove, East Sussex, UK About Blog Sailing Magazine Appealing to all sailors with a mix of informative practical and entertaining stories about the life a float. Facebook fans 5,083. Twitter followers 1,331. Scarborough, Queensland About Blog Subscribe to keep up with the latest updates on sailing events, news, sailing activities programs, challenges and social sailing. Dublin, Ireland About Blog Sailing News from the Royal St George Yacht Club. The recreational suburb of Dun Laoghaire in South County Dublin, the Royal St George Yacht Club is one of Ireland's leading Yacht Clubs. Facebook fans 2,174. Twitter followers 1,529. Annapolis, MD, United States About Blog A blog by Rod Minche that is all about Sailing, boat building, dinghy racing, Vintage sailboats, scow sailing and more. About Blog Dinghy Dreams is a journal of a sea gypsy by a nautical neophyte. 40. Where is Brick House? About Blog Wandering the globe....of course! Together, we make a great team taking our home around the world! Gulf Shores, AL About Blog Come along for the ride as two sailors from different worlds take a journey across the Atlantic with their two Beagles. Get points of view from the beginner and the experienced sailor on sailing, travel destinations, and wildlife. Facebook fans 10,053. Twitter followers 334. Facebook fans 1,003. Twitter followers 312. Rome Tuscany London Valencia About Blog Devoti Luca's Sailing blog featuring saling news, his olympic sailing experinces, boat handling tips and techniques and much more. Facebook fans 484. Twitter followers 5,759. Richmond, CA About Blog Tradewinds Sailing School & Club has been teaching sailors in the Bay Area since 1962, offer a full range of American Sailing Association courses, from Basic Keelboat to Offshore Passage Making, as well as our own specialty courses like Advanced Motoring and Docking and Advanced Anchoring. Facebook fans 1,113. Twitter followers 928. About Blog Sailing in RussiaTravel tale/ adventure story and cruising guide on how the first foreign-flagged boat sailed from the Arctic to the Black Sea. Facebook fans 701. Twitter followers 45. Ireland About Blog Into The Mystic is yet another blog about sailing. Cluttering up the Internet with tall tales of the high seas, and leaving less and less space for pictures of cats. Of course, no true website about sailing would be free from rants about boat maintenance. About Blog Everything you ever wanted to know about pontoon boats is here in one place. Read pontoon boat reviews, helpful hints, tips, and much more about pontooning. About Blog The story of buying and keeping a (production) cruising sailboat afloat long enough to prep it for cruising! 50. Sailing To Win Blog! About Blog Hello and welcome to our blog. We are Michael & Lisa and we are cruising aboard our sailboat Footloose. Hopefully, this blog will capture our adventure. Caribbean Sea About Blog A couple of travel junkies, traveling by sea, land and sometimes air. Living the nomadic freestyle life. Always looking for new ways to build their Roaming Income to sustain this lifestyle. Facebook fans 933. Twitter followers 450. About Blog Our sailing blog lets you know what BlueFoot Travel, Nemo and her crew are up to. Also find news, discounts, promotions and sailing tips and tricks here. Facebook fans 936. Twitter followers 405. Sneek, Friesland, Netherlands About Blog This blog is about the Racing Rules of Sailing for sailors, race officers, judges and umpires. Anything to do with the rules. On or off the water, in the protest room or umpiring in a rubber duck, attending a seminar or reading a news item. Facebook fans 316. Twitter followers 107. About Blog Lyme Regis Sailing Club was formed in 1921 by a small group of sailing enthusiasts with the object of encouraging amateur sailing. Vancouver, British Columbia About Blog David and Carol Severson show you how they renovated a MacGregor sailboat set by step with sailing tips to help you learn to sail. Facebook fans 6. Twitter followers 601. New York, NY About Blog A blog dedicated to traveling, sailing, adventures, and all things water. Facebook fans 24,360. Twitter followers 1,164. Facebook fans 107,358. Twitter followers 5,673. About Blog Teresa Carey and Ben Eriksen write on sailing, boats, simplicity, happiness, living aboard, cruising, voyaging, traditional navigation, and safety. Facebook fans 12,889. Twitter followers n/a. Rhode Island About Blog US Sailing offers training and education programs for instructors and race officials, supports a wide range of sailing organizations and communities, issues offshore rating certificates, and provides administration and oversight of competitive sailing across the country, including National Championships and the US Sailing Team. Facebook fans 61,848. Twitter followers 28,357. About Blog Discover how you can get into the sport of Laser sailing, as we walk you through a step-by-step guide to get you onto the water fast. Facebook fans 583. Twitter followers 1,598. About Blog A sailing blog for sailors, boaters, cruisers, and racers. For all things boating, including a Marine directory and sailing training course. Facebook fans 1,503. Twitter followers 5,330. Tiverton RI About Blog Proper Course is a blog with random rants about sailingby a guy who sails a Laser and an RS Aero. Facebook fans 139. Twitter followers 1,566. Facebook fans 2,060. Twitter followers 76. Grenada About Blog Blogs about learning to sail, Grenada, The Grenadines and The Caribbean. Everything about our sailing school and yachting in general. Facebook fans 247. Twitter followers 37. Berlin, Germany About Blog The motorboat & Sailing Blog featuring sailing culture, desinations, sailing tips, boats, travel wtiters and bloggers and more. Facebook fans 42,724. Twitter followers 1,855. About Blog Coastapus is a blog dedicated to sailing on the west coast of British Columbia. With countless places to explore by sailboat, this blog shares places to explore and general ideas for spending time on your sailboat. Facebook fans 33. Twitter followers 12. Cairns, Queensland About Blog EVERYTHING you need to know about sailing in one place. We travel the world sailing on our sailboat. We will be adventuring around the world as we travel by sailboat and learn to sail. Learning how to sail will involve everything there is to know about bluewater cruising, storm tactics, and more! Facebook fans 428. Twitter followers 241. Australia About Blog Dreamtime Sail is a sailing blog of Australians Rob & Karen who sail their 42' Ketch "Our Dreamtime" where ever the wind takes them. Facebook fans 1,663. Twitter followers 621. About - SAIL Magazine is the magazine of record on the sailing way of life. Whether it’s cruising, racing, or lifestyle, our editorial mission is to inspire, educate and entertain sailors of every kind and to celebrate the sport in words and images. About - Sailing Anarchy has become the largest sailing site on the net. It is a forum for industry insiders and racing sailors to exchange ideas. About - The United States Sailing Association (US Sailing), the national governing body for sailing, provides leadership, integrity, and growth for the sport in the United States. About - Scuttlebutt is a digest of major yacht racing news, commentary, opinions, features and dock talk with a North American emphasis. About - Sailing Today is the magazine for hands-on cruising sailors whose love of sailing takes them around the British Isles, across the Channel and beyond. About - Affectionately referred to by regular readers as 'Britain's Biggest Sailing Magazine North Of The South', Yachting Life is a monthly publication featuring racing and cruising in Scotland, North of Ireland, the North of England and the Isle of Man. About - Established in London in 2000 by the late Saul Masson, First Class Sailing is now owned by Principal Charlie Tulloch. About - Leading suppliers of own-brand technical watersports clothing and specialist chandlery items. Our layering system is designed to provide a range of flexible options to suit any condition on the water. About - Established in 1931, Sail Canada (formerly known as the Canadian Yachting Association) is the national governing body for the sport of sailing. About - We're serious about sailing but even more serious about teaching others how to sail. About - Best boat reviews on sail boats, power boats and yachts. Many boats reviewed including. About - Dreamtime Sail, a sailing blog of Australians Rob & Karen who sail their 42 &39; Ketch "Our Dreamtime" where ever the wind takes them. About - The Bloke and his blog mistress aboard their yacht Zofia. About - Everyone can live a Whitsundays yachting dream... Let Charter Yachts Australia help start yours. About - Offering 7 day wind & wave forecasts, live weather reports, and watersports communities. Need to know the conditions before you head out? Great communities for Kitesurfing, Windsurfing and Stand Up Paddle. About - Yachting Association of India, the governing authority for the sport of sailing, power boating and PWC in India. 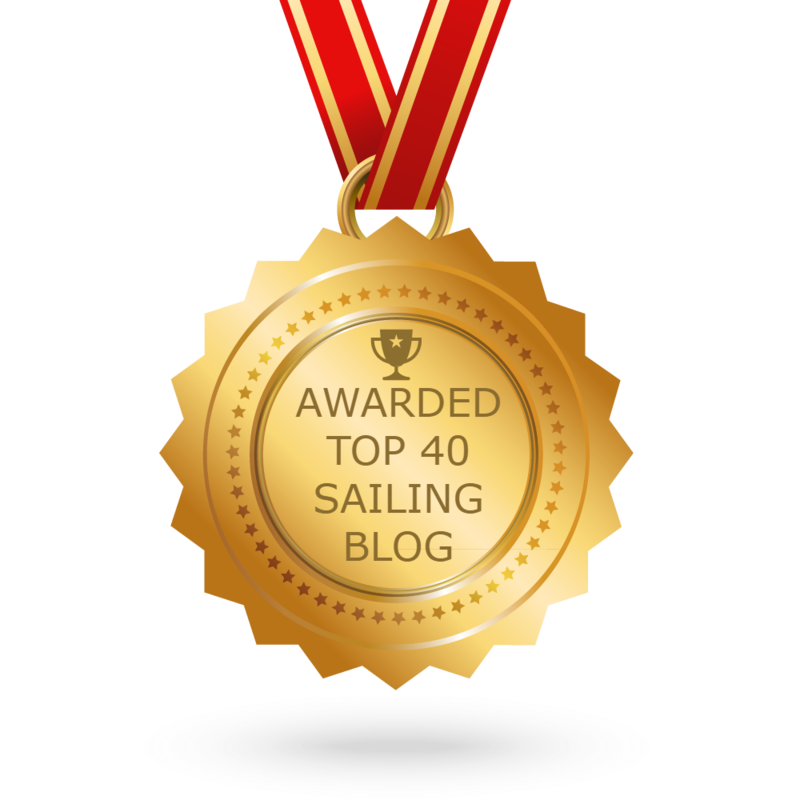 CONGRATULATIONS to every blogger that has made this Top Sailing blogs list! This is the most comprehensive list of best Sailing blogs on the internet and I’m honoured to have you as part of this! I personally give you a high-five and want to thank you for your contribution to this world.